HomeThe BestThe best headphones for mixing hip-hop | NARROWING IT DOWN! The best headphones for mixing hip-hop | NARROWING IT DOWN! When it comes down to the best headphones for mixing hip hop, some things need to be taken into consideration. Before we get started in deciphering, grab a snack, sit back and relax because..
It’s hard to believe how far my studio has come over the last few years. When I first started sampling back in 2009, I only had a laptop and a KORG padKONTROL. In 2007 I had just started making beats. I had some old Logitech R20’s, and a dream. Lol. That speaker set worked wonders for a number of years, but the bass was much too “boomy,” and for the most part my mixes were pretty shoddy. For the longest time I had a pair of the classic Sony MDRV150’s, and though they snapped under pressure worse than Henry Hill (hehe), they did the job for a number of years, even before I made beats at all! I appreciated the sound and comfort enough to purchase multiple pairs of them before graduating on to bigger and better things. It wasn’t until I purchased a pair of Sony MDR 7506’s that I really took a step in the right direction. My beats started to sound light-years better, even though I still wasn’t using a traditional studio monitor set up. With a laptop, the padKONTROL, and the 7506’s, I made beats for about a year or 2 before settling on what I have currently. I realized that my sound was never going to magically become better using my laptops internal sound card, so I purchased an external one. 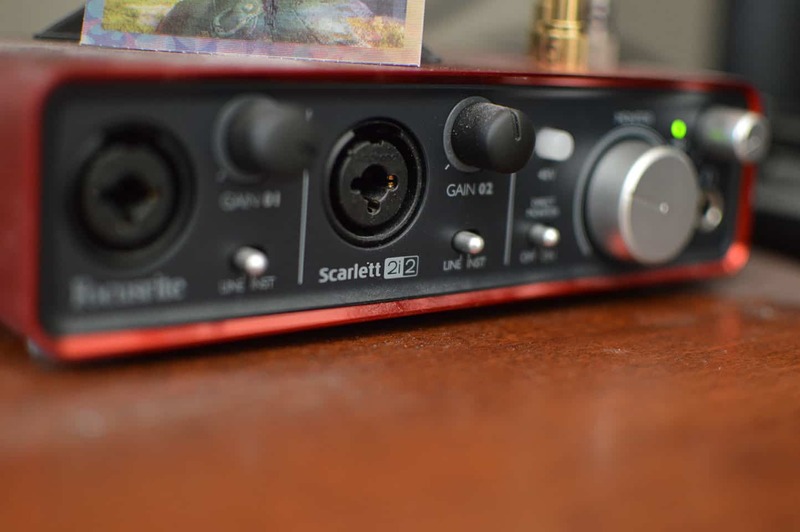 The technical name for it is an audio interface, and it dramatically improves your entire rig. Your Audio Interface! The first interface I bought was the M-Audio Fast Track Pro. I had all sorts of issues with it. Even with the phantom power switch on, it recorded so quiet that I literally had to scream into the mic to hear myself, and even then the recording was awful as far as volume. The quality was decent, but overall it was a pain to use due to driver issues and what not. Needless to say I sold it and purchased the Focusrite Scarlett 2i2 some years later. I haven’t looked back! A long with that purchase, I invested in a pair of JBL LSR 305’s, because it’s good to have both headphones and monitors when mixing (for reference purposes). Check out my JBL LSR 305 Review! However, for the longest time I got by on headphones just fine. The 7506’s are an excellent pair of monitor headphones because they are brutally honest and revealing (due to the treble range and overall flat response). That can be a gift and a curse. Why? Because the treble can sometimes be very harsh and sibilant. What does sibilant mean? I would have to take frequent breaks because of this issue. I still recommend them and the MDR V6’s as affordable solutions however, as their positives far outweigh the negatives. In January 2013 I bought a pair of Audio Technica ATH M50’s, and they’re still going strong to this day. I can say without a doubt these may be the most durable headphones on the planet. I literally throw them in my bag everyday, and generally abuse them without a care in the world. They’re still just as good as ever. For mixing? I wouldn’t use them solely for mixing, but they will work. I have used mine to fine effect over the last 3+ years. They are more for the casual consumer however. I also ended up trying out the Sennheiser HD 280’s. These may be the flattest of the bunch, but are extremely boring in my opinion. Dual ASUS PA 248Q Monitors (I’m totally spoiled). What are the best headphones for mixing hip hop? I’m going to run through a few more affordable recommendations, and then go into some higher end models. Sony MDR 7506/MDR V6. These are both immensely popular and for good reason. Each sports an extremely flat sound signature, perfect for mixing in studio. If you want to see the subtle differences between each, check out my post Sony MDR V6 vs. 7506! My post on the best headphones for mixing under $100 also points to the V6. Want the official review? Sony MDR V6 Studio monitor series headphones. Shure SRH440. Shure SRH 440 headphone Review. May be the flattest overall, but comfort and build issues hold this one back from the top spot. Sennheiser HD 280. Sennheiser HD 280 Pro Headphone Review. Extremely flat and honest, but too boring for the top spot. Check out my post on the best closed back studio headphones. It will outline all of the options that you should consider. Just know that the top spot for closed back are a bit more expensive (around $200). I wrote an article awhile back on the best studio headphones for mixing, and in it I outlined 3 of the top choices, all of which I still stand by to this day. Sennheiser HD 600. This is my top recommendation overall, and it’s absolutely priceless. The Gold standard. Check out the Sennheiser HD 600 Review! Beyerdynamic DT 880. A close second, this one doesn’t get the top spot because of that harsh treble range. I went back and forth for a long time before making the decision to include this as runner up and not champion. AKG K701/Q701. The K701 is a great mixing headphone that does suffer from an abnormally large sound-stage. Very bass light and lean, this one is also among the best for classical and jazz as well. The best headphones for jazz. If you’re itching for more bass, the Q701 improves upon all the shortcomings of the K701, including the awkwardly wide sound-stage present in the 701. AKG Q701 vs. K701. Why are open back headphones better for mixing? Sound-stage. What is Soundstage. It mimics the effect of having surround sound speakers, and doesn’t leave you exhausted in the process. A best of both worlds scenario! Closed back vs. Open back headphones. To simplify your decision making process, I will recommend the best one in each category for mixing. CHECK OUT MY OFFICIAL SONY MDR V6 REVIEW! SEE MY AKG K550 HEADPHONE REVIEW!! CHECK OUT THE Q701 FOR YOURSELF ON AMAZON!! CHECK OUT MY SENNHEISER HD 600 REVIEW!! Well that’s about it for today my friend! I hope you have a clear idea about the best headphones for mixing hip hop. There are quite a few, but the process can be simplified down as I’ve shown here. Which of these do you gravitate more towards? Let me know as well. I would love to hear from you..
Best studio headphones for mixing | SOLID OPTIONS! Lol, right? Thanks for stopping by!